Over the years, O2Compost has developed a reputation for designing simple, highly effective on-campus university compost systems for processing food waste, landscape debris and mixed paper products. We believe that on-campus composting goes a long way to helping colleges and universities meet their sustainability goals by eliminating the transportation component that is required for off-site disposal. Many universities are focusing their attention on demonstrating and teaching sustainability, as evidenced by the robust membership of AASHE (The American Association for Sustainability in Higher Education). One of its members, St. John's University in New York, has achieved their Gold Rating with the AASHE-STARS Program, in part because of their O2Compost facility and the reuse of the universities compost in garden and turf applications. Click HERE To learn more. 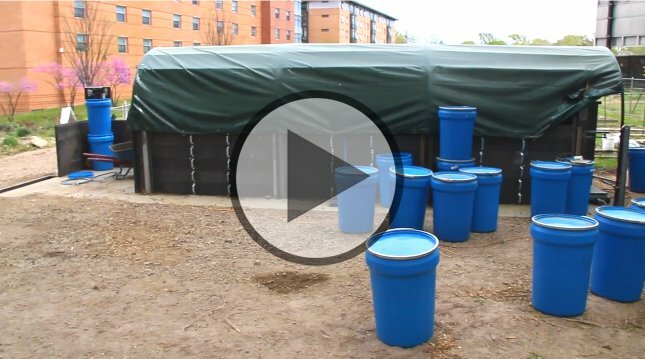 All of the composting principles that are applied on college and university campuses are equally applicable to corporate campuses, medical facility campuses, and even summer camps.